It’s been a crazy week of birthdays… A quick post to share a photo or two. 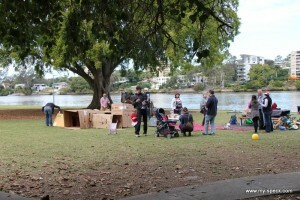 We celebrated O’s 3rd Birthday in the park on the weekend with a robot and rocket party. What does that look like? 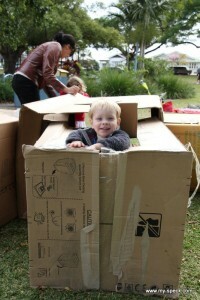 Lots of big refrigerator boxes all joined up to make a robot spaceship, decorated with stickers and stick-ons. Filled with small children popping their heads up through the funny windows and openings. And crawling between all the adjoining boxes like crazy. Lots of fruit for morning tea. 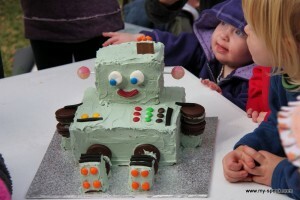 And, of course, a robot cake. Which the smallest one managed to swipe icing off while I was trying to light the candles! Happy Robot Birthday my beautiful boy!